The 2015 Wauseon Homecoming Grand Marshal is Ruth Zimmerman. She is truly thrilled to be selected by the Wauseon Homecoming Committee and is looking forward to the parade. The committee for the 81st Wauseon Homecoming has selected Ruth Zimmerman as Grand Marshal for the parade to be held Saturday, Aug. 1. She continues to be a vibrant and warm person, eager to visit about modern times and current developments. 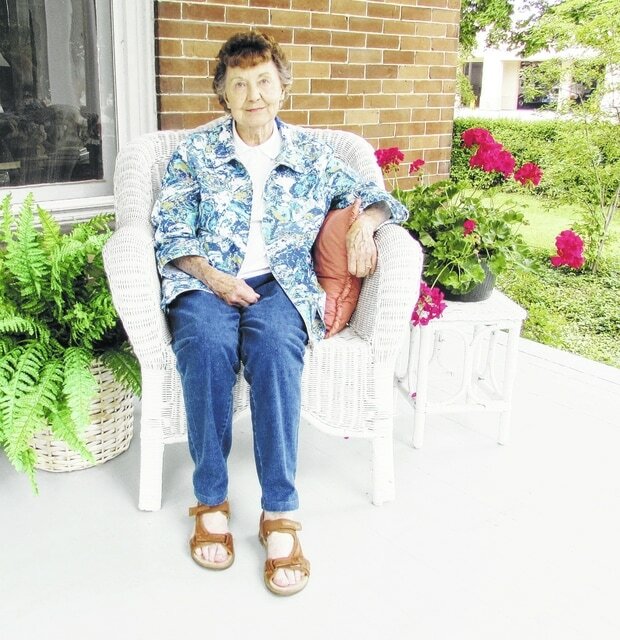 She and Wayne Zimmerman, her dearly, departed husband, did many major projects to help the citizens of Wauseon, both young and old, find positive activities where none existed. The parade begins at 11 a.m at the courthouse and flows north on Fulton Street and goes east onto E. Elm Street. Ruth Perrin, a native of Perrysburg, and Wayne Zimmerman were married Nov. 28, 1941. “Gosh, the next week was Pearl Harbor. What a way to remember an anniversary,” she noted. They found a home to share on W. Elm Street., close to North Park and Wayne secured work with a sign company. Before Wayne was inducted into the military, they had two daughters, Bonnie and Lynn. “They were my war babies,” Ruth said. In a few short years, the girls’ health took some dramatic turns as they were finally diagnosed with Batten Disease. A very progressive and destructive disease, it interfered with their development, both physically and mentally. These circumstances propelled Wayne and Ruth into founding a school for children needing special educational opportunities outside of readily available public education. Working with local and state organizations, various agencies and elected officials, they started a school which served special needs children from Henry, Williams, Defiance and Fulton counties. It was named Happi-Time School. In 1953, the school was housed in the basement of Evangelical Mennonite Church, 410 N. Shoop Ave., now the location for Christ’s Church. After a number of years of fundraising, the group broke ground in July 1960 for a free standing building on S. Shoop Avenue, across from what is now the campus of the Fulton County Health Center. Shortly afterwards, the activities surrounding Happi-Time School went from the Welfare Department to eventually became part of the Board of Development Disabilities. Wayne and Ruth eventually had two more daughters, Angie, who married Roger Nagel of Wauseon and Sherrin who married Dave Dominique. He was originally from Archbold and they now live in Bryan. Ruth was named to The Book of Golden Deeds in 1962 for all those efforts as well as the work she and three other women were doing to develop facilities for the senior citizens. Wayne passed away in 2003. Ruth wrote feature stories, news articles and other special pieces for the Wauseon Republican, spanning the 1950s through the 1970s. She had her own column, “This ‘N’ That,” where she wrote on a wide range of topics, such as history, local events and local residents. She was well known for her wit and sense of humor in her coverage of others, especially when it involved her own family and their adventures during their vacations. She also wrote publicity and fundraising articles to be used by the Fulton County Health Center, many local civic organizations such as United Way and the American Legion Post #265. She and a small group developed the News Press, a small newspaper that was about and for the people of Wauseon. She would include photographs with her interviews, showing how people who worked together would make Wauseon a better community. Ruth was an long time member of the Wauseon Child Conservation League, had served as a volunteer for the FCHC Auxiliary, a member of the Ohio Association of Special Needs Children and Adults and a member and supporter of the Ohio Association for Batten Disease Support and Research. Over the past seventy-plus years, Ruth has joined a large number of groups and has been a vibrant doer and leader. She found the time to assist on many school events, past Wauseon Homecomings, Fulton County Fairs and other community activities. And now, Wauseon wishes to reach out and show their appreciation for Ruth Zimmerman’s dedication to the town she has grown to love.